Symbols*: The monkey is an inquisitive creature with the capacity to perform amazing physical feats. Swinging from tree limb to tree limb, it can create order out of seemingly chaotic branch formations. The tree branches represent growth and productivity. The golden belt reinforces the divine nature of the monkey. The golden disk reflects his desire for achievement. 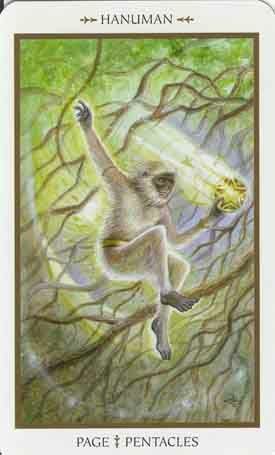 Swirls of cosmic energy accompany the monkey as he glides through the forest in search of new adventures. Description*: Hanuman was a devoted Hindu monkey god who demonstrated amazing physical agility. He was the son of the wind god Vayu and loyal servant and friend to Rama, the seventh avatar of Vishnu. During Rama’s battle with the demon king Ravana, Hanuman leapt across to sea to Sri Lanka. Hanuman’s amazing ability to morph and transform himself into other physical forms served him well along his journeys. On his way to Sri Lanka, he encountered the female demon Surasa. In order to avoid being consumed by her, Hanuman distorted his body so that it fit uncomfortably in Surasa’s mouth. He then shrank down and enlarged once again before blowing though her ear. Upon landing in Sri Lanka, Ravana’s warriors attempted to stop Hanuman by setting his tail on fire, but instead of it inhibiting his ability to wage warfare, he leapt from building to building, setting them all on fire. He also rescued Rama’s wife, Sita, from the abducting hands of the enemy and returned her safely to Rama. Because of Hanuman’s hard work and loyalty to Rama, he was blessed with eternal youth. Possible Meaning: Hanuman’s ability to work hard and earn the reward of youth can be applied to our own situation. Enjoy the fruits of your labour. If need be, indulge in a little something or take a breather and engage in an activity that is fun and adventurous. Be careful not to get too caught up in the malaise of a day-to-day routine. We should be inventive and think of ways to address our inner child. A diversion from routine will do wonders to promote health and youthful energy. Thoughts/Points to Ponder: This page is fast in his movements. He has a very youthful energy. I get the sense that he is also a daydreamer yet very down-to-earth.